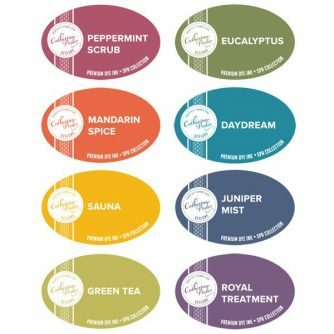 The spa collection of ink pads by Catherine Pooler is another eight deeper richer shades of colours inspired by a trip to the spa to soothe away all your tensions and make your stamping relaxing. There are 8 colours in the Zen Garden collection. Each colour is available separately as ink pad only, refill only, or together with as a bundle of ink pad and refill. Daydream – a deep soothing sky blue. Eucalyptus – a deep olive green for masculine, sophisticated or classic colours. Green Tea – a soothing light olive shade. Juniper Mist – a deep rich elegant navy blue. Mandarin Spice – warm, earthy and exotic. Peppermint Scrub – a dark earthy red – use with Green Tea and Eucalyptus for an elegant feel. Sauna – a warm golden yellow.